Hydrocarbons—molecules critical to life—are routinely generated by the simple interaction of seawater with the rocks under the Lost City hydrothermal vent field in the Atlantic Ocean, according to research led by the University of Washington and the Woods Hole Oceanographic Institution (WHOI). 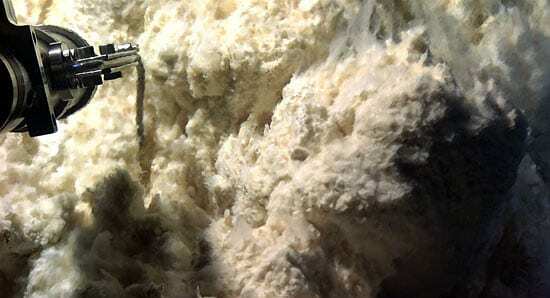 The production of such building blocks of life makes Lost City-like vents strong contenders as places where life might have originated on Earth, according to Giora Proskurowski and Deborah Kelley, two authors of a paper in the Feb. 1 issue of the journal Science. Researchers have ruled out carbon from the biosphere as a component of the hydrocarbons in Lost City vent fluids. Hydrocarbons–molecules with various combinations of hydrogen and carbon atoms–are crucial to cellular life. For instance, cell walls can be built from simple hydrocarbon chains, and amino acids are short hydrocarbon chains hooked up with nitrogen, oxygen, or sulfur atoms. “The generation of hydrocarbons was the very first step; otherwise Earth would have remained lifeless,” says lead author Proskurowski, who conducted the research while earning his doctorate from the University of Washington (UW) and during post-doctoral work at WHOI. Some researchers believe the first building blocks of life made their way from outer space, while others hypothesize that the right ingredients were generated by geological process on Earth—perhaps at hydrothermal vent systems, where seawater seeps into Earth’s crust and picks up heat and minerals until the water is so hot that it vents back into the ocean. 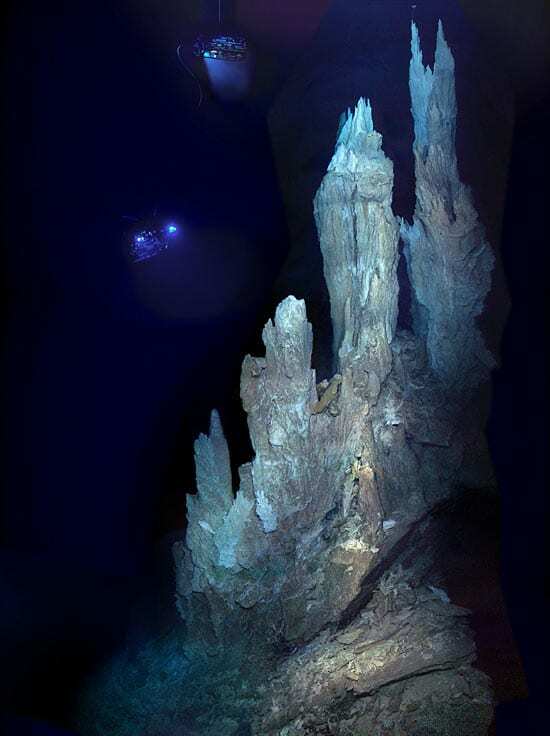 The Lost City hydrothermal vents, discovered in the mid-Atlantic by Kelley and colleagues during a National Science Foundation-sponsored expedition in 2000, are formed in a very different way than the black smoker vents that scientists first discovered in the 1970s. Black smokers are so named because it can appear as if dark smoke is billowing from them. 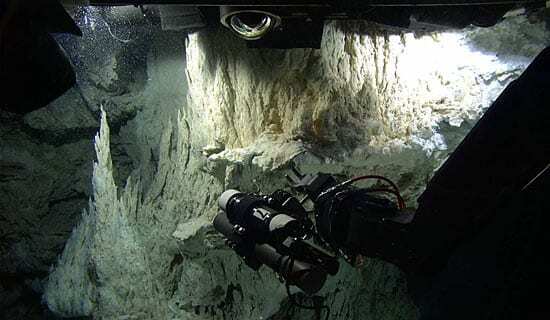 In fact, the “smoke” is actually iron- and sulfur-rich minerals precipitating from scalding vent waters—as hot as 760°F—meet the icy cold depths. The spires and mounds that form are mottled mixes of sulfide minerals. 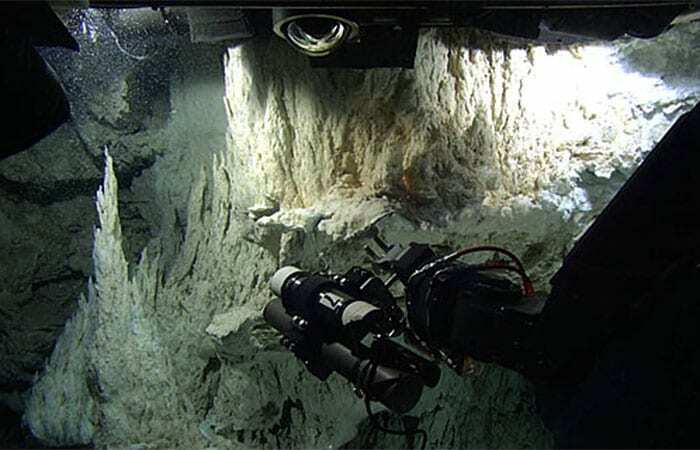 In contrast, structures at the Lost City hydrothermal vent field are nearly pure carbonate—the same material as limestone in caves—and they range in color from white to cream to gray. These structures drape the cliffs at Lost City and range from the size of tiny toadstools to the 18-story column named Poseidon, which dwarfs most known black smoker vents by at least 100 feet. The field was named Lost City in part because it sits on top of a submerged mountain named Atlantis and was discovered by chance during an expedition on board the WHOI-operated research vessel Atlantis. The water venting at Lost City is generally 200°F. The fluids do not get as hot as the black smokers because it is not heated by magma; rather, the heat comes from serpentinization, a chemical reaction between seawater and mantle rock. That’s also the reason for all the hydrocarbons. Naturally occurring carbon dioxide is locked in mantle rock. At Lost City, the reaction between the rock and seawater produces 10 to 100 times more hydrogen and methane (a hydrocarbon) than a typical black smoker system found along volcanic mid-ocean ridges, Proskurowski and Kelley found. The Lost City system forms hydrocarbons in higher concentrations and with more complexity than at typical black smoker systems, says Kelley, a UW professor of oceanography and principal investigator on a 2005 National Oceanic and Atmospheric Administration (NOAA) expedition that gathered samples analyzed for the Science paper. The hydrocarbons produced at Lost City were not formed from atmospheric carbon dioxide because none of the carbon carries the radioisotopic signature that would be present if they had been exposed to sunlight, Proskurowski says. Analysis of rock from Lost City shows that the hydrocarbons are not coming from the living biosphere either. Rock in contact with seawater has a very consistent ratio of carbon dioxide to helium. But the rock at Lost City had a strikingly different ratio. It turns out that the depleted amount of carbon dioxide in the rocks roughly equals the amount of hydrocarbons being produced in the fluids, he says. “The detection of these organic building blocks from a non-biological source is possible evidence in our quest to understand the origin of life on this planet and other solar bodies,” Proskurowski says. Lost City is exceptional, Kelley says, because chemical reactions in the seafloor produce acetate, formate, hydrogen, and alkaline fluids. All these substances may have been key to the emergence of life, according to work published recently by Michael Russell and A.J. Hall of Glasgow and William Martin of Germany. In addition, acetate and formate found in Lost City fluids may have been an important energy source for the ancestors of methanogens, microorganisms that live off the methane at places like Lost City. It is one more bit of evidence about where life may have originated, Kelley says. 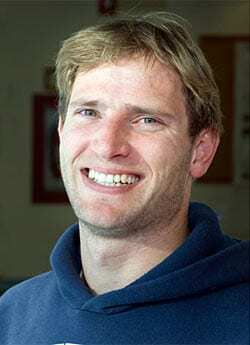 Co-authors of the paper, “Abiogenic Hydrocarbon Production at Lost City Hydrothermal Field,” include Marvin Lilley and Erick Olson from UW, Jeffrey Seewald and Sean Sylva from WHOI, Gretchen Früh-Green from the Swiss Federal Institute of Technology, and John Lupton from NOAA’s Pacific Marine Environmental Laboratory. The Lost City hydrothermal vent field lies about 2,300 miles east of Florida, along the Mid-Atlantic Ridge, at a depth of 2,600 feet. Microorganisms there thrive in alkaline vent fluids, some nearly as caustic as liquid drain cleaner. This contrasts to the previously studied black-smoker vents, where organisms have adjusted to acidic water. Lost City microbes live off methane and hydrogen instead of the carbon dioxide that is the key energy source for life at black-smokers. Although nobody has found another field like Lost City, Kelley says she’s sure others exist because there are so many other places where mantle rock has been thrust up through the seafloor, exposing it to seawater and serpentinization. It is likely that even more mantle rock was present in the oceans of early Earth, Kelley says.